I thought it was obvious that the names and identities of Federal Air Marshals are supposed to remain secret. I know several FAMs and I’d never ever disclose their identifying info. It’s well known that Federal Air Marshals whose names have been publicly disclosed are useless to to the FAMS program. You don’t have to be a rocket scientist or brain surgeon to figure that out. But apparently you do have to have a few more brain cells than yenta co-hosts of ABC’s “The View,” Elisabeth Hasselbeck and Joy Behar (which isn’t difficult, given the high levels of air inside their heads). On this morning’s episode of the anti-male vapidity-fest (which is in Los Angeles, this week), Hasselbeck (sadly ABC’s version of conservatism–dumb, ignorant, and not too conservative beyond talking points someone fed her) announced to the audience. We’d like to thank Robert Thompson. She and Behar then went on to tell us that Mr. Thompson was sitting next to them on their Sunday First Class flight from New York to Los Angeles, that he told them he was a “View” fan and wanted to take pictures with them. They said he told them during the flight that he was coming home from serving in Iraq and that his family paid for the First Class upgrade. At the end of the flight, these brainiacs–Hasselbeck and Behar–told the world that this guy, Thompson, told them he was really a Federal Air Marshal. It didn’t occur to these two geniuses that maybe they shouldn’t announce and disclose this info on TV. 6) Don’t claim you’re a fan of “The View,” and expect anyone in the Federal Air Marshal Service to ever believe again that you’re a man (admitting to this–even if you’re making it up–tells us all you left your man card back at the departure gate, never to be found again). Like I said, you don’t need to be brain surgeon or rocket scientist to know not to announce these details on national TV, but for these “View” hags, Hasselbeck and Behar, it’s apparently a rocket surgeon. For all Hasselbeck’s bloviating about worrying about America’s national security, she won’t even think twice about jeopardizing it, herself. And this starstruck Air Marshal didn’t think twice about telling these blabbermouths who he really is. Time for Mr. Thompson to get desk duty. His cover’s been blown. WTF was he thinking? Our agency does not condone its agents slobbering over celebs like a soccer mom sitting next to Brad Pitt. I mean of alllll people to yap to? Jeez. I can count the number of times I have even engaged someone in conversation in the last year on one hand. Biggest fan-FAM deserves whatever the agency does to him. I hope his teammates take him aside and advise him that they don’t like him risking their asses to score points with a washed up menopausal comic and her token Chrissy Snow RINO sidekick. They are sheep and they don’t like the sheepdogs so it’s not like he can win them over to the conservative way of thinking. Wow is all I can say. PS Thanks for torturing yourself with “The View,” so I don’t have to. This guy may not have been an air marshall in the first place. There can’t be too many in law enforcement that would admit to being a view fan. I suppose there are a few testosterone challenged, probably in supervisory positions. At times that’s the best place for them because it gets them out of most situations that demand quick thinking with use of force implications. If he really was an air marshall he may not have gotten into the line of work for the balls it takes but the money. These days in this job market a lot of guys will do it soley for the cash. I work with roughly 50% of the officers being pretty gutless. And being in Iraq doesn’t guarantee guts either. There are plenty of rear echelon posts. In the rear with the gear. Before I’m attacked I’ll go on record as being a veteran as well as a prison guard. If I work with a guy that owns up to watching the view me and my fellow coworkers would ride that guy for the remainder of his career. Just the way it is. We are primarily a conservative, testosterone filled lot. Thank G-d.
Great points again. Loose lips sink ships. I really cant stand Hasslebeck more than the rest because she is such an airhead and is portrayed as a conservative. She has the credentials all Conservatives are envious of: SHE WAS A “SURVIVOR” CONTESTANT, HER CLAIM TO FAME!!! She is a total tool for the other Hags. Then what really lost me with Palin was bringing Hasslebeck to the campaigns. I am now just an independent who will vote Republican as a necessary evil. The Republicans will never win the “Cool” contest and the Dems love to bring them to the party then humiliate them for not being hip. Republicans then become good foils for Dems in the public eye. Now I see where Elizabeth got the idea for those sunglasses. I had to sit through the Bonnie Hunt show about two weeks ago with Rosie O’Donnell. She sat there and told a story about sitting next to a soldier on his way back from Iraq as well in first class. She couldn’t believe a soldier was flying first class that he pestered him with a ton of questions until he bellied up that he was a FAM. 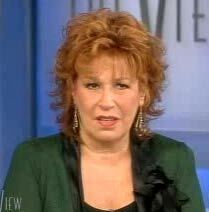 Hasselback and Behar = not too bright. But why would any genuine FAM reveal to any passenger – famous or not – their real identity??? Methinks the guy is bogus. ……..or else he’s just as dumb as they are…. FAM’s are never given a 1st class seat. They actually are required to sit as far back in the plane as possible so they have full view of all on the plane. They are always in an isle seat and would never give out their identity. They are armed and people that would cause harm know that. Are you sure? First of all, if I was planning an attack and knew the FAM was way back, I could easily plan something to keep him from getting close to me. There are many other reasons to not believe this. What happens when curtains dividing parts of the plane are closed? If what you are stating is true, you are an idiot for revealing it here. Lastly, I bet this gut told them he was an FAM just to see if he could scam them. I bet he and his buddies are having a big laugh right now. Joy is such an inappropriate name for someone with a look of perpetual disgust on their ugly face. And Hasselblech looks like her head would pop like a baloon if you pricked it. The View is such a disgusting piece of trash, you don’t even need the sound turned up to hate it. Walters looks like a walking corpse, and Goldberg is damn near painful to look at. Can they be prosecuted? Does the first amendment cover their compromising security? And what if the marshal hadn’t been so careless? Thompson is an idiot. He is the same caliber as the View Hags. It would not surprise me if Thompson was a former Bureau of Prisons Guard (BOP). Bunches of them came to FAMS because they call themselves -Law Enforcement- HAH. A few good folks came from there, but I mean a very FEW! I am so glad I left but that leaves a bunch of Thompsons. I feel so sorry for the good FAMs out there surrounded by these idiots. God save the FAM service!